St. Louis Park was unique in Minnesota due to its Postwar population growth that occurred faster and earlier than most other cities in the region. 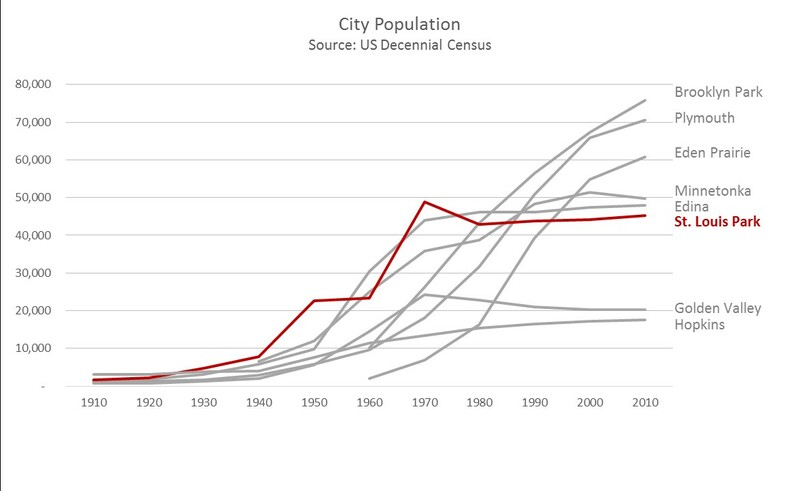 Its population also leveled off faster, as shown in the chart below. Population for St. Louis Park peaked between 1970 and 1980, with some reports saying that it reached 50,000 during that time as the Baby Boom peaked. At one time it was the fourth largest City in the State of Minnesota. It is estimated to reach a similar level again in by 2020 given the development of new higher density housing developments.